Gerry - The major work has been on infections caused by bacteria. We focussed on two specific types: Staphylococcus aureus (of which one form is MRSA) and another organism called Pseudomonas aeruginosa which is a quite common organism. It's found in water but fortunately only in certain situation does it really cause a bad infection. Chris - Why is Staph and MRSA such a problem? Gerry - It's a little bit difficult to say why it has become a bigger problem recently. Some of the issues seem to be greater exposure. More people seem to be carrying MRSA. It's basically for years and years was pretty much only found in people in the hospital. Now it's clearly out in people in the community. It's spreading more. Chris - How many people have got it? 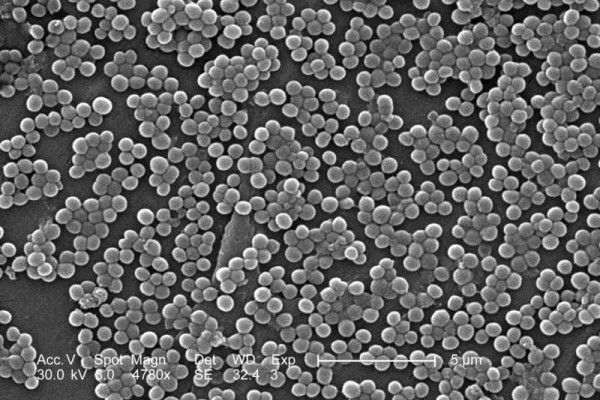 Gerry - About 30% of people are carry Staphylococcus aureus in their nose. A smaller percentage - maybe around 2-5% carry MRSA. That's more than it used to be. Even though that sounds like a small number when you think of all the people out there it's really a large number of people overall. Chris - What are you doing to try and stop that? Gerry - One of the factors that has been very useful in making vaccines has been to extract the materials that bacteria put out on their outer surface. That allows us to immunise individuals and get immune responses, usually antibodies, that can cause the bacteria to be killed. We've discovered that there is a specific type of surface material that's actually a sugar molecule. Scientists call it a polysaccharide that if we chemically change it somewhat it causes a very good immune response. Those antibodies are then capable of killing the Staph and preventing infections or perhaps limiting infections so that they don't become as severe. Chris - What you're saying is that people who don't have this vaccine - there's something about the surface of the Staph that stops you making an immune response normally. Gerry - Correct. It turns out that one of the ways that bacteria avoid causing an immune response that would kill them is to trick your body into making the wrong kinds of antibodies. The bacteria don't care you don't have those antibodies because they don't harm the bacteria. Our job has been to try and figure out how to get the right kinds of antibodies that will kill the bacteria. Chris - Do you know how they fought the immune system in that way? Gerry - It's a little bit complicated because it involves looking at this very detailed structure of this sugar molecule that coats the bacteria. In general what we find is that the sugar molecule has projections from the sides and those projections are involved in causing the non-killing or bad antibodies to form. Those antibodies bind to the bacteria ok but they don't cause other factors of the immune system to stick to the bacteria. These other factors are essential for killing. It's the structure of this sugar molecule overall that gets the wrong kinds of antibodies mostly made. What we've done is we've changed the structure so we get antibodies that then bring in these other factors that are needed to kill the bacteria. Chris - So you're just injecting people not with bacteria but with chemicals from the surface of the bacteria that drive this response? Gerry - So far we've only injected mice, rabbits and monkeys. Although we're fortunate that there is movement towards making this into a human vaccine, optimistically we'd hope perhaps within two or three years we'll see our first humans immunised with this material. It's going in the right direction but so far we only have data from animals. Chris - Will the same chemical trick work on other infections because it's not just Staph that make us ill, is it? Gerry - We're fairly optimistic that is the case. We've shown with our laboratory studies that the same vaccine can be effective against E. coli which is also another common cause of infections in a hospital. The bacteria that causes whooping cough also makes this. The organism that causes plague makes it. There's a lot of other organisms that have become quite problematic in the hospital setting because they're very resistant to the antibiotic drugs that we commonly use to treat infections. In some cases we don't have any antibiotics at all. We're hoping our vaccine or perhaps antibodies we make in the lab might be effective against these microbes as well. Chris - Do you think there's any risk that the bacteria could, once you start treating large numbers of people with this, could become resistant? Bacteria change very rapidly. They've become resistant to lots of antibiotics. Could they thwart your vaccine? Gerry - This is always a possibility. What one tries to do when you make a vaccine is to make it our of something that the organism has to have. If it stops making it then it no longer causes infections. In our laboratory studies we've shown that if staphylococcus doesn't make this material it's much less able to cause an infection. We're hoping that'll be the case but we're still a ways away from knowing that with any certainty.